We know how frustrating it can be to see students at youth group only get excited when they play games and when every element of the evening is overly-stimulating. What's even more frustrating, is after a carefully planned lesson, none of the students seemingly absorbed what was said. Learn about 5 habits youth ministries across the nation are using to effectively engage their students in the gospel message and deeper discipleship. 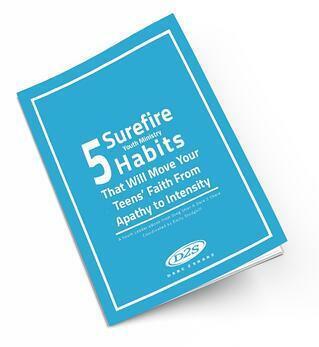 Gain practical tips for ways to use these simple habits in your youth ministry context. Begin applying these habits immediately. At the end of the eResource, you'll find a quick action plan designed to help you begin using each of the 5 habits in the next two months . Enjoy the read, and take the simple steps toward a more passion-filled youth ministry today!